The benefits of drinking apple cider vinegar are not largely debated as study after study has proven its health benefits. Shire City Herbals has taken this healthy vinegar and combined it with other good-for-you stuff to make a delicious tonic called Fire Cider! As a vinegar-based tonic, it'll cause your mouth to pucker. So, just one tablespoon per day should do it for you. The original one has honey in it, but now the Unsweetened version is 100% vegan. Made with oranges, lemons, onions, ginger, horseradish, garlic, turmeric, and habanero pepper, there isn't one ingredient in the bottle that isn't super good for you. I love the way it tastes--you get the pucker when you first drink it with the slight burn down the back of your throat once it goes down. It's delicious! They say that apple cider vinegar can kill many types of bacteria, lower blood sugar levels, lower cholesterol, and may have protective effects against cancer. This tonic is not cheap at $15 per 8-ounce bottle, but with all these good-for-you certified organic ingredients, it seems like a good investment. Fire Cider, you left me on fire! You know you can make this stuff really cheaply. 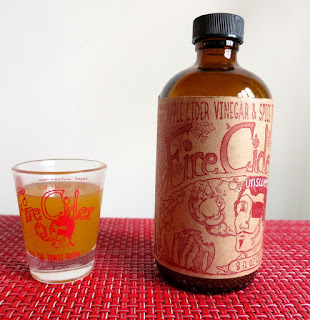 Please consider changing your review to reflect the fact that "Fire Cider" was patented by this company, taking advantage of herbalists all over the US and especially Rosemary Gladstar who invented this concoction. The company claims they made it up. But they didn't. And they are suing herbalists now for making something all of us have been making for a long time. Please support grass-roots herbalism, not Shire City Herbals. Hi Co-op folks, I am REALLY Surprised (not in a good way) to see that you carry Shire City Herbals "Fire Cider". They trademarked a common herbal remedy created by Rosemary Gladstar and are suing small herbalists for using the name. That goes against everything that home medicine makers and people who want good health (and thus shop at the Co-op) believe in. Please take a few moments to read this website and consider NOT doing business with this company. They are profiting from grass-roots herbalism and that is not the kind of products I want to see in our Co-op. I agree! It's a term that is not properly patented. It is a common term used traditionally and that was used before they tried to "own" it. Shame on them!